Although there still won't be NHL cards for Connor McDavid for a few months, Upper Deck has provided collectors a chance to earn a redemption for one with a special 2015-16 O-Pee-Chee promotional offer. Nine different puzzle cards will be randomly distributed in packs of 2015-16 OPC Hockey. Collectors who build the full set can send the cards to Upper Deck to receive an exclusive Edmonton Oilers #1 Draft Pick card that is numbered to 97. While they cannot officially say it is McDavid since he has not made his debut, the intention is clear. Because there are only 97 copies, the offer is first-come, first-serve and there is no guaranteed card simply by building the set. 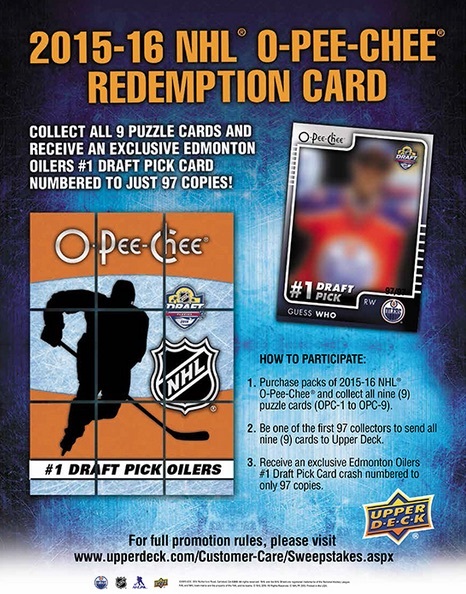 The release date for 2015-16 O-Pee-Chee is early September and the live redemption card is expected in December. If you cannot wait until then, check out the top prospect cards for Connor McDavid here. Specific details on the promotion can be see here. UPDATE: On 10/8/2015, Upper Deck announced via their Twitter account that the promotion was completed. i am trying to find out where I can see how many puzzles have been redeemed for the opc connor mcdavid card. can u help? jerry � That would be a question to direct to Upper Deck. now that mcdavid has played are we going too be able to see a pic of the draft card we get and do we know if it’s signed that would be cool ? How many have been redeemed now? Is it worth collecting them still? Liam � As noted in the article, the promotion is now over. I think this Connor McDavid promotion was interesting but to the people buying the product it was quite the gamble. If you are lucky to get one of these cards the value will be great. I have noticed that these promotion cards are still being sold on ebay so most sellers and collectors have no clue the promotion is over. I would think Upper Deck must be getting some negative feedback on this promotion. Thoughts? I’ve been trying to find a couple of cards to finish sets. Just noticed someone has a pre-sale for an OPC #1 Draft Pick – McDavid. It’s listed at $2001 in Canadian dollars! It’s the second post I’ve seen. Someone else had three listed for pre-sale, all at $935. All three sold. I’ve also seen folks selling the 9 card puzzle, even after all 97 cards had been redeemed. The two I saw went for almost $500. Hopefully the buyers are aware they cannot redeem them for cards. Clever marketing by UD OPC for sure. I’ll be curious to see what these cards sell for after their release later this month.